I don’t know about you, but Fall gets me in the mood for warmer dishes. 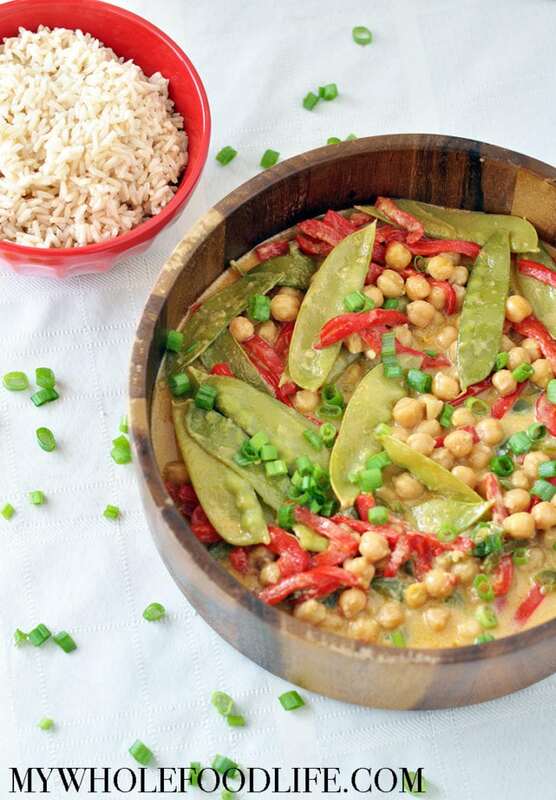 That is exactly what I have for you today with this Green Curry with Chickpeas. The warm spices from the curry paste plus the protein from the chickpeas make this a hearty and satisfying dish! This recipe can be served on it’s own, over rice, or you can re-purpose it into a wrap with rice for leftovers. It also happens to be gluten free in addition to being vegan. Pulses are affordable and one of the most cost-effective proteins available. For example, a serving of lentils costs only 10 cents while a serving of quinoa costs 59 cents! Pulses are super versatile and can be used in sweet or savory dishes. My favorite sweet recipe that calls for pulses is my almond joy flourless blondies. I also use them in many savory dishes such as my mixed bean salad. Pulses are good for the environment because they can help feed the world. They have a lower carbon footprint when compared to other food groups. They are also water efficient and help enrich the soil, reducing the need for chemical fertilizers. Pulses are nutrient dense. They have high levels of potassium, magnesium, zinc, B vitamins, and iron. One example would be black beans. One serving of black beans has 1.5 times the amount of iron as flank steak. Another example would be red kidney beans, which have more antioxidants than blueberries! Won’t you join me in taking the Pulse Pledge – a 10 week commitment to eat more pulses (at least once a week) in 2016! You can check this site for all kinds of delicious pulse recipes! The perfect hearty and healthy dish for Fall! In a large saucepan, add the coconut milk and turn on low heat. Add the garlic, curry paste, onion powder and stir until well mixed. Add the pepper, jalapeno, snow peas and chickpeas and cover. Cook about 8-11 minutes, stirring occasionally, until the peppers begin to soften. Once the peppers soften, remove from heat. Salt to taste, top with chopped green onion for garnish, and serve over rice. I served over brown rice. This should last at least 3-4 days in the fridge. Enjoy!